With the industry’s recent focus on ensuring crushing and shearing points on gates, roller shutters and garage doors are made safe; ride-on safety on security grilles and shutters generally used to secure shop fronts and underground car parks can sometimes be overlooked. 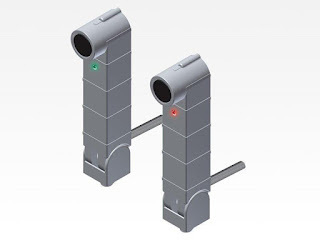 The Twin-Safe and Twin-Pro sensors by Witt Sensoric have been specifically designed for pull-in protection. The Twin-Safe has a potential free relay output and test input and is compliant to CAT2, PLc according to EN13849-1. The Twin-Pro allows for direct connection into an OSE (Optical Safety Edge) input. Other features include simple alignment with its pivoted joint and single point mounting, front-facing LED alignment indicator for easy installation, insensitivity against ambient light and a high degree of protection – IP67 – makes it a robust safety solution for most applications. Further information and videos on these products can be found on IN2 Access & Control Ltd.’s website - in2access.co.uk .